Gamers on the lookout for a sturdy RGB mechanical keyboard with incredibly customizable lighting options should put the M750 on their shortlist. What was once seen as a novelty item has also become a staple of PC gaming kit. Mechanical keyboards are now mainstream as most manufacturers have multiple options available for all gaming and productivity needs. Steelseries is no different and has a RGB-illuminated beast that will likely find a home on many desktops. The APEX M750 mechanical keyboard is the company's big dog and is built like a tank while still offering the RGB sweetness that many crave. The APEX M750 is a full-size board that makes use of an aluminum frame. The board does not twist or bend when pressure is applied. When you remove it from the box, it feels incredibly sturdy. It features a set of ABS plastic keycaps with a large easy-to-read font and a standard layout. The no-nonsense first impression the board gives inspires confidence in the purchase. The back of the board has a plastic finish, though the middle is a glossy fingerprint magnet. I’m not sure what purpose it serves as the user will never really see it. Rather than the standard flipper feet you get on most keyboards, Steelseries opted to go with rubber lifters that can be swapped out to fit your desired board angle. It seems like a good idea, but in practice, I had them fall out when I moved the board more than a few times and never felt like they offered any benefit. A non-braided USB cable is hardwired into the top of the board at the center position. A removable cable would have been nice for this price point, but it’s no deal breaker. There are no cable management channels under or around the board, if that matter to you. They keycaps sit above the board deck, allowing the clear housing to be seen easily. Some users may prefer having the bottom of the caps covered up, but I prefer mine this way. It helps show off the backlights and makes cleanup much easier than it would be on a board without the switches exposed. Sadly, my box didn’t come with a keycap puller, so the process of removing the caps for cleaning (or replacement) will be tedious unless you have a puller handy. Speaking of the keycaps, the APEX M750 uses a nice set of ABS plastic toppers with a good font. It doesn’t have an awful futuristic robot font that is tough to read or visually unappealing. The caps allow the RGB backlighting to shine through clearly and everything is easy to use, even in the darkest of rooms. The spacebar and a few of the larger key had stabilizers installed, helping every tap feel good, even if you don’t get a well-centered press. While I prefer PBT-style keycaps, the included caps on this board work well. Thankfully, mechanical keyboard enthusiast will be happy to know that this board supports replacement cap sets, thanks to the Cherry MX-style stems on the switches. Steelseries partnered up with Gateron to produce the switches found on the APEX M750. Dubbed QX2, these switches have a linear action that is somewhat similar to that of a Cherry MX Red. There is no tactile bump during switch activation, so this may not be the best choice for typists, but it works very well for gaming. The QX2 switches activate smoothly and return to position very quickly. I didn’t have a board with Cherry MX Reds handy to do a direct comparison, but these QX2 switches seemed to offer a similar level of noise. Bottoming out the keys with heavy-handed use was a little loud, but that is no fault of the switches. As for the backlighting, users will need to install the Steelseries Engine software to get the most out of the RGB lights on the board. While I’m no big fan of most PC gaming peripheral companies’ software suites, I found that the SteelSeries Engine made customizing the APEX M750 easy and legitimately offered lots of functionality. You can download lighting profiles that are game-specific and there are plugins that let the keyboard synergize with some of the more popular gaming apps such as Discord. You can even load animated gifs into the Steelseries Engine and have the board reproduce the animation (the quality of which is heavily dependent on the complexity of the gif you choose). I used the APEX M750 for a few weeks to handle work duty and play games in the evening. I didn’t like the linear action QX2 switches for typing as much as the Cherry MX Blues on my main keyboard, but the gaming experience was great. The fast response and smooth action worked wonderfully in Battlefield 5 and I never experienced any issues with ghosting. I even took the time to sync up the lights on the board with my Steelseries Rival 310 mouse. It made me happy the first few times I looked at them, then I pretty much forgot about it. 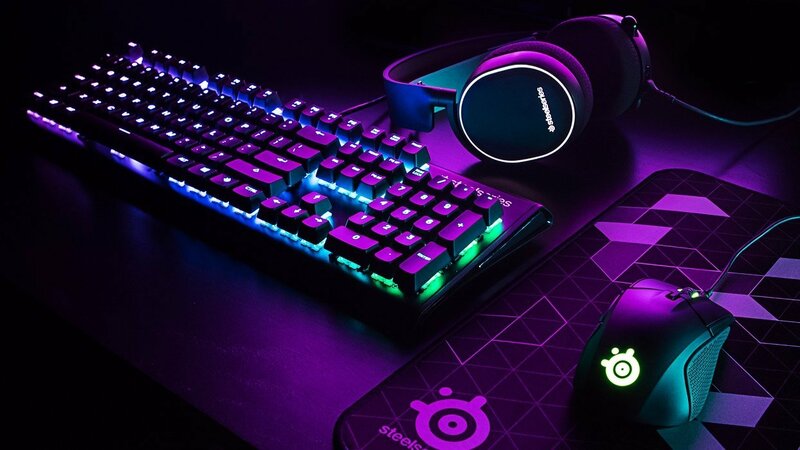 Overall, the folks at Steelseries are offering a solid board at a price similar to competing offerings from Corsair, Coolermaster, and Razer. I liked the sturdy build quality, the restrained keycap font, and the lighting functionality offered by the Steelseries Engine. The QX2 switches were solid, though it would be nice if Steelseries offered this board with a variety of switch options. I would have prefered a detachable cord and a keycap puller be included, but these are no deal breakers. I don’t really know what was going on on the back of the board, but the removable rubber risers are a bad choice and the alternating finish types made no sense. You can find similar boards for the same money, but I feel that the Steelseries APEX M750 is currently the best choice if RGB backlight customization is a big deal for you in a dedicated gaming mechanical keyboard. This review is based on hardware provided by the manufacturer. The Steelseries APEX M750 is available for Windows, Linux, and OSX PCs. It retails for $139.99.